Wilson, 30, will not sign a long-term contract with Seattle at all if he doesn’t get one by the end of Monday night, per NBC Sports’ Peter King. Wilson’s agent, Mark Rodgers, and the Seahawks have been working hard at hammering out a deal still, by all accounts. Even if Wilson doesn’t sign by the end of Monday, many believe the dynamic QB would be content playing as many as the maximum three consecutive one-year franchise tag deals. So the lack of a contract extension doesn’t mean Wilson is gone. Former NFL coach Jack Del Rio, however, said recently on NFL Network that he wouldn’t be surprised if Wilson eventually were traded. “(D)on’t be surprised if before it’s all said and done, when we line up for the season next year, if Russell Wilson isn’t quarterback somewhere else and the Seahawks haven’t gone and gotten a quarterback they think for the future,” Del Rio said. 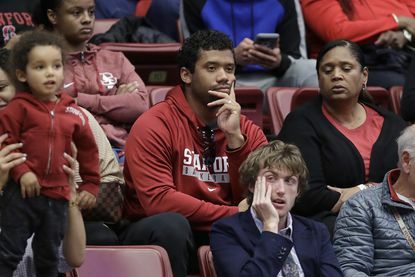 Then Mike Florio of ProFootballTalk reported this weekend that the Seahawks think Wilson would like to play elsewhere, even if he hasn’t or wouldn’t ever say it. That could have been a trial balloon for the Seahawks to gauge interest from potential suitors such as the Giants. We all know Seattle would need to call Dave Gettleman, though, since the Giants GM believes if he initiates a trade call, he immediately loses leverage (insert collective eye-roll here). So stay tuned. While the Giants opened offseason workouts on Monday, what happens in Seattle could be a bigger story than whatever transpires in East Rutherford.